Small flower, long name. This tiny flower is another sign that spring is on the way. It carpets ditches and marshy areas in our garden at Nedd (NC1331), where this photograph was taken on 18th March 2015. It is Opposite-leaved golden-saxifrage Chrysosplenium oppositifolium, found in wet places across Assynt. It has no petals and the fresh greenish-yellow of the tightly clustered flowers derives from their four fleshy sepals and eight yellow anthers. 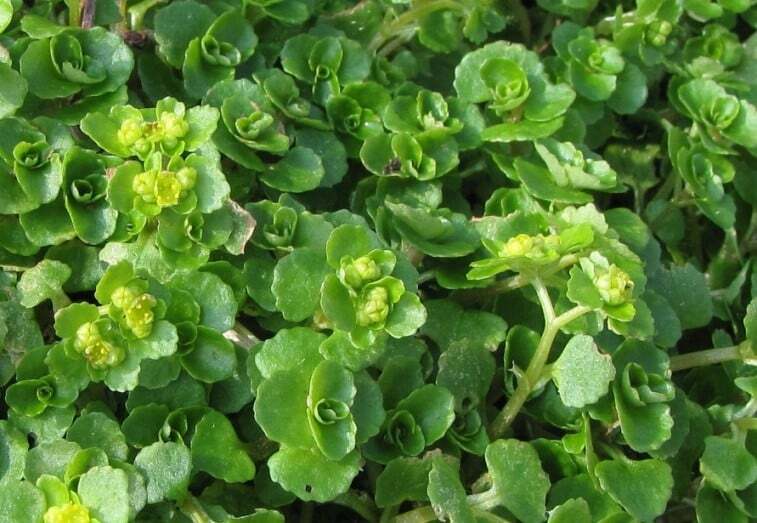 A close relative,Alternate-leaved golden-saxifrage C. alternifolium, is one of our rarest local plants. Pat and I found a small patch in a limestone flush a kilometre inland of Ardvreck Castle some ten years ago, the first time it had been noted in the north-west of Scotland. We have never seen it in flower, but fortunately it has distinctive parasol-like hairy leaves.